For the National Rail station, see Euston railway station. For the nearby Underground station on the Circle, Hammersmith & City and Metropolitan lines, see Euston Square tube station. Euston is a London Underground station served by the Victoria line and both branches of the Northern line. It directly connects with Euston main line station above it. The station is in Travelcard Zone 1. 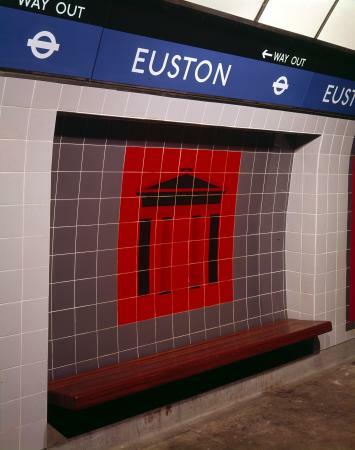 Euston was constructed as two separate underground stations. 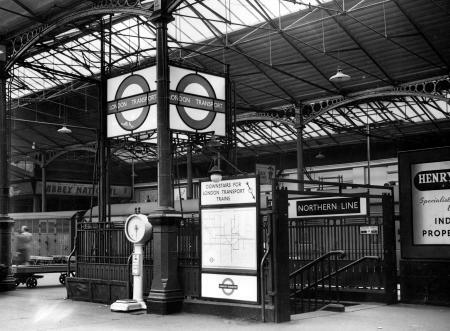 Three of the four Northern line platforms date from the station's opening in 1907. The fourth Northern line platform and the two Victoria line platforms were constructed in the 1960s when the station was significantly altered to accommodate the Victoria line. Plans for High Speed 2 and Crossrail 2 both include proposals to modify the station to provide interchanges with the new services. On the Northern line's Bank branch the station is between Camden Town and King's Cross St Pancras. On the Charing Cross branch it is between Mornington Crescent and Warren Street. On the Victoria line it is between Warren Street and King's Cross St. Pancras. The station is near Euston Square station allowing connections at street level to the Circle, Hammersmith & City and Metropolitan lines. An underground station to serve Euston station was first proposed by the Hampstead, St Pancras & Charing Cross Railway in 1891. 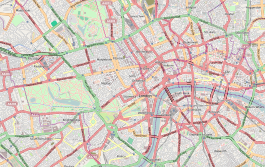 [n 1] The company planned a route to run from Heath Street in Hampstead to Strand in Charing Cross with a branch diverging from the main route to run under Drummond Street to serve Euston, St Pancras and King's Cross stations. 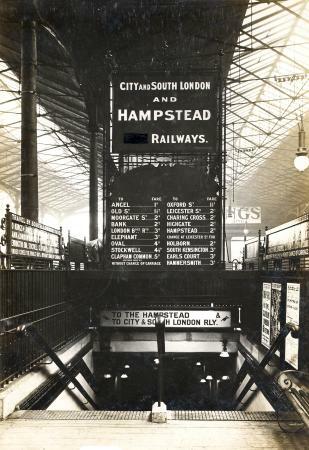 Following parliamentary review of the proposals and a change in name to the Charing Cross, Euston and Hampstead Railway (CCE&HR), permission was granted for the route in 1893, although the branch line was only permitted as far as Euston. For the remainder of the 1890s, the CCE&HR struggled unsuccessfully to raise the necessary capital to fund construction of the new line. Whilst doing so it continued to develop its route proposals. In 1899, parliamentary permission was obtained to modify the route so that the Euston branch was extended northwards to connect to the main route at the south end of Camden High Street. The section of the main route between the two ends of the loop was omitted. [n 2] In 1900, the CCE&HR was taken over by a consortium led by American financier Charles Yerkes which raised the necessary finance. Also in 1900, a proposal was presented to parliament by the Islington and Euston Railway (I&ER) for an extension of the City and South London Railway (C&SLR) from Angel to Euston. At the time, the C&SLR was in the process of constructing an extension to Angel from its recently opened terminus at Moorgate Street. [n 3] The extension plan was initially permitted in 1901, but delays in the parliamentary process meant that it had to be re-submitted the following year. The second submission was opposed by the Metropolitan Railway, which saw the extension as competition to its service between King's Cross and Moorgate, and the plan was rejected. A third attempt, presented to parliament in November 1902 by the C&SLR itself, was successful and approved in 1903. With funding obtained, tunnelling for the CCE&HR was carried out between September 1903 and December 1905, after which the station buildings and fitting-out of the tunnels commenced. 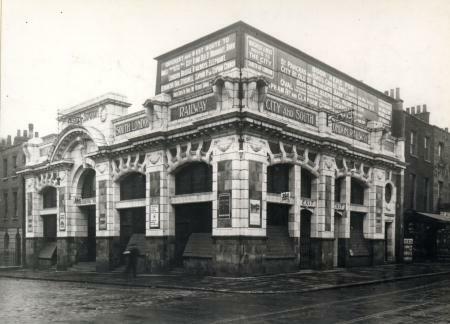 The C&SLR's Euston extension was constructed at the same time from the newly opened Angel station and opened on 12 May 1907, with the station building designed by Sidney Smith located on the east side of Eversholt Street. The CCE&HR opened on 22 June 1907, its building, designed by Leslie Green, is located at the corner of Drummond Street and Melton Street. Although built and initially operated as two separate stations by the two companies, the C&SLR and the CCE&HR platforms were sufficiently close together that a deep level interchange was constructed between the passages of the two stations with a small ticket office for passengers changing between the lines. Another passage led to lifts that surfaced within the main line station itself. With the entrance within the main line station able to serve both sets of platforms satisfactorily, the separate station buildings were considered unnecessary, and they both closed on 30 September 1914. The CCE&HR building remains (converted for use as an electrical substation), but the C&SLR's building was demolished in 1934 to enable the construction of Euston House for the London, Midland and Scottish Railway. Most of the C&SLR's route had been constructed with tunnels 10 feet 2 inches (3.10 m) or 10 feet 6 inches (3.20 m) in diameter, smaller than the 11 feet 6 inches (3.51 m) diameter that had been adopted as the standard for the CCE&HR and other deep level tube lines. [n 4] The smaller tunnel size restricted the capacity of the C&SLR's trains and, in 1912, the C&SLR published a bill for their enlargement. A separate bill was published at the same time by the London Electric Railway (LER),[n 5] that included plans to construct tunnels to connect the C&SLR at Euston to the CCE&HR's station at Camden Town. Together, the works proposed in these bills would enable trains of each company to run over the route of the other, effectively combining the two separate railways. The reconstruction and extension works were postponed during World War I and did not begin until 1922. The C&SLR platforms and the tunnels between Euston and Moorgate were closed for the reconstruction on 8 August 1922. 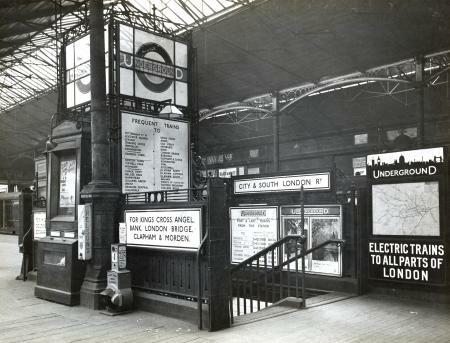 They reopened on 20 April 1924 along with the new link to Camden Town. Plans for the route that eventually became the Victoria line date from the 1940s. A proposal for a new underground railway line linking north-east London with the centre was included in the County of London Plan in 1943. Between 1946 and 1954, a series of routes were proposed by different transport authorities to connect various places in south and north or north-east London. Each of these connected the three main line termini at King's Cross, Euston and Victoria. [n 7] A route was approved in 1955 with future extensions to be decided later, though funding for the construction was not approved by the government until 1962. In conjunction with the reconstruction of the main line station above, a new ticket hall was excavated below the concourse with two sets of escalators replacing the lifts. The escalators provide access to and from an intermediate passenger circulation level, which, in turn, gives access to the Northern line Charing Cross branch platforms and two further sets of escalators; one set each serving the northbound and southbound Victoria and Northern line Bank branch platforms. Interchanges between the northbound and southbound Victoria and Northern Bank Line platforms are made via a passageway at the lower level so as to avoid the need to use the escalators. An emergency stair to the intermediate interchange level is located midway along the passageway. The Victoria line platforms opened on 1 December 1968 when the second section of the line was opened between Highbury & Islington and Warren Street. Disused passages remain with tiling and posters from the 1960s. Unlike the neighbouring main line termini, St Pancras and King's Cross, Euston is not served by the Circle, Hammersmith & City and Metropolitan lines. Euston Square station, which is served by these lines, is approximately 250 metres (270 yd) to the south-west. Plans for the redevelopment of the main line station for High Speed 2 (HS2) include the construction of a direct connection to Euston Square. The CCE&HR station building on Melton Street sits within the HS2 development site area and will be demolished to make way for the station. Proposals for Crossrail 2 include an underground station serving Euston and St Pancras that will be integrated with the existing London Underground station. The station is in Travelcard Zone 1. On the Northern line's Bank branch the station is between Camden Town and King's Cross St Pancras. On the Charing Cross branch it is between Mornington Crescent and Warren Street. On the Victoria line it is between Warren Street and King's Cross St. Pancras. Train frequencies vary throughout the day, but generally, Northern line trains operate every 2–6 minutes from approximately 05:49 to 00:45 northbound and 05:49 to 00:28 southbound. Victoria line trains operate every 2–6 minutes from approximately 05:41 to 00:42 northbound and 05:31 to 00:26 southbound. London Bus routes 10, 18, 30, 59, 68, 73, 91, 168, 205, 253, 390 and 476 and night routes N5, N20, N91 and N253 serve Euston bus station outside the main line station. ^ The Metropolitan Railway's original underground line, opened in 1863, had a station at the junction of Euston Road and Gower Street, but this is approximately 250 metres (820 ft) south-west of the main line station. Originally, named "Gower Street", the station was renamed "Euston Square" in 1909. ^ A separate proposal in 1899 by the Baker Street and Waterloo Railway for a branch from its planned line near Regent's Park to Euston was rejected by Parliament. The station building would have been located in Cardington Street. ^ The C&SLR was suffering from a poor financial reputation at the time due to what was seen as the wasteful abandonment of its original terminal at King William Street when the extension to Moorgate was built. The I&ER was constituted as a nominally separate company to avoid this poor reputation, though it shared a chairman with the C&SLR. ^ The only section of the C&SLR's tunnels constructed with 11 ft 6 in diameter tunnels was the section between Bank and Moorgate. ^ The LER was formed by the Underground Group in 1910 through a merger of the CCE&HR with its two other deep level railways, the Baker Street and Waterloo Railway and the Great Northern, Piccadilly and Brompton Railway. ^ Instead, the LNWR's trains for the new line operated from the surface station and the company collaborated with the Underground Electric Railways Company of London to extend Bakerloo tube services from Paddington to Queen's Park in tunnel, where they met the LNWR's new line. 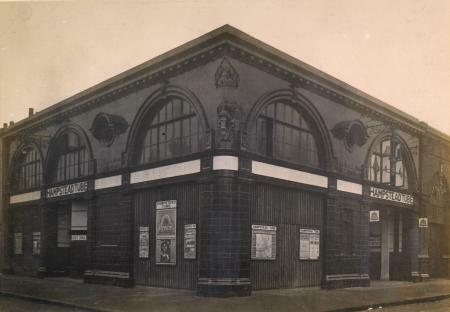 Bakerloo services started to Queen's Park in February 1915, before extension to Willesden Junction in May 1915 and on to Watford Junction in April 1917. ^ In 1946, the Railway (London Plan) Committee published a report including "Route 8 – South to North link from East Croydon to Finsbury Park", a main line service running between Norbury and Hornsey in tunnel via Streatham Hill, Brixton, Vauxhall, Victoria, Bond Street, Euston, King's Cross and Finsbury Park. In 1947, the London Passenger Transport Board produced a plan for a similar route for a tube line running into north-east London. This ran between Coulsdon North or Sanderstead and Walthamstow (Hoe Street) or Waltham Cross. These plans were reviewed by the British Transport Commission in 1949 and a feasibility study was recommended. This became a combined route, "Route C" running between Walthamstow and Victoria. ^ The diversion took place on Sunday 15 October 1967. ^ This arrangement results in an unusual feature of the station: a passenger changing between the Victoria line and Northern line Bank branch will find that trains on adjacent platforms travel in opposite directions even though both are either northbound or southbound (see diagram). ^ "Out of Station Interchanges" (XLS). Transport for London. May 2011. Archived from the original on 20 October 2012. ^ "No. 26226". The London Gazette. 24 November 1891. pp. 6324–6326. ^ a b c d e f g Rose 1999. ^ Badsey-Ellis 2005, p. 58. ^ "No. 26435". The London Gazette. 25 August 1893. p. 4825. ^ a b Badsey-Ellis 2005, p. 118. ^ "No. 27025". The London Gazette. 22 November 1898. pp. 7134–7136. ^ "No. 27107". The London Gazette. 11 August 1899. pp. 5011–5012. ^ Badsey-Ellis 2005, p. 84. ^ "No. 27249". The London Gazette. 23 November 1900. pp. 7482–7483. ^ a b Badsey-Ellis 2005, p. 96. ^ Badsey-Ellis 2005, p. 139. ^ Day & Reed 2010, p. 47. ^ Wolmar 2005, p. 185. ^ a b c d Connor 2006, p. 125. ^ Badsey-Ellis 2005, pp. 55–56. ^ Badsey-Ellis 2005, p. 86. ^ "No. 28665". The London Gazette. 22 November 1912. pp. 8802–8805. ^ "No. 28311". The London Gazette. 23 November 1909. pp. 8816–8818. ^ "No. 28402". The London Gazette. 29 July 1910. pp. 5497–5498. ^ "No. 28665". The London Gazette. 22 November 1912. pp. 8798–8801. ^ Badsey-Ellis 2005, p. 268–269. ^ "No. 27970". The London Gazette. 23 November 1906. pp. 8181–8182. ^ Badsey-Ellis 2005, p. 269. ^ a b c Badsey-Ellis 2005, p. 270. ^ Day & Reed 2010, p. 143. ^ a b "Victoria Line – History". Clive's Underground Line Guides. 11 November 2014. Retrieved 6 April 2015. ^ Day & Reed 2010, p. 148. ^ Day & Reed 2010, p. 153. ^ a b Day & Reed 2010, p. 160. ^ "Euston (poster image)". Abandonedstations.org.uk. Retrieved 12 April 2015. ^ a b Day & Reed 2010, p. 168. ^ Report of Society Meeting (PDF) (Report). London Underground Rail Society. 10 June 2014. Retrieved 16 July 2015. ^ a b Transport for London (March 2019). Standard Tube Map (PDF) (Map). Not to scale. Transport for London. Archived (PDF) from the original on 5 April 2019. ^ "Euston Tube Station". Google Maps. Retrieved 12 July 2015. ^ Euston Area Plan – A new plan for the Euston Area (PDF). Greater London Authority/Transport for London/London Borough of Camden. January 2015. p. 101. Retrieved 27 June 2015. ^ "Replacement London Underground Substation & Vent Shaft". HS2 in Camden. Retrieved 10 November 2018. ^ "The Route". Crossrail 2. Mayor of London/Transport for London/Network Rail. Archived from the original on 15 March 2015. Retrieved 27 June 2015. ^ "Northern line – First and Last trains" (PDF). Transport for London. 15 December 2014. Retrieved 27 June 2015. ^ "Victoria line – First and Last trains" (PDF). Transport for London. 8 March 2015. Retrieved 27 June 2015. ^ "Buses from Euston" (PDF). Transport for London. 17 June 2017. Retrieved 31 July 2017. ^ "Night buses from Euston" (PDF). Transport for London. 31 August 2013. Archived (PDF) from the original on 14 July 2015. Retrieved 14 July 2015. Badsey-Ellis, Antony (2005). London's Lost Tube Schemes. Capital Transport. ISBN 185414-293-3. Connor, J.E. (2006) . London's Disused Underground Stations (2nd ed.). Capital Transport. ISBN 1-85414-250-X. Railway (London Plan) Committee (1946). Report to the Minister of War Transport. HMSO. Rose, Douglas (1999) . The London Underground, A Diagrammatic History (7th ed.). Douglas Rose/Capital Transport. ISBN 1-85414-219-4. Wolmar, Christian (2005) . The Subterranean Railway: How the London Underground Was Built and How It Changed the City Forever. Atlantic Books. ISBN 1-84354-023-1. Wikimedia Commons has media related to Euston tube station. This page was last edited on 25 January 2019, at 08:32 (UTC).